Young developers working in their start-up office. They are having lunch break. Sitting by the desk and eating pizza. Location is released. Do you have a hard time resisting the pull of a free dessert or snack left out for enjoyment in the office kitchen? Maybe you have a co-worker who buys Mega Stuf Oreos, eats six of them and leaves the package out for everyone — which inevitably means you, and you go on to eat six more. If you feel like you’re carrying a little extra weight around as a result of your snacking desires, read on — it looks like we’re all blaming our jobs for it. A CareerBuilder survey found that 56% of American workers think they’re overweight, and 45% of them blame it on their job. The survey, which CareerBuilder conducted this spring and released today, consulted 3,400 full-time employees who work in various industries and company sizes across the country. Here’s what we’re saying about why we gain weight on the job. Our lack of time for exercise is a major reason we gain weight. 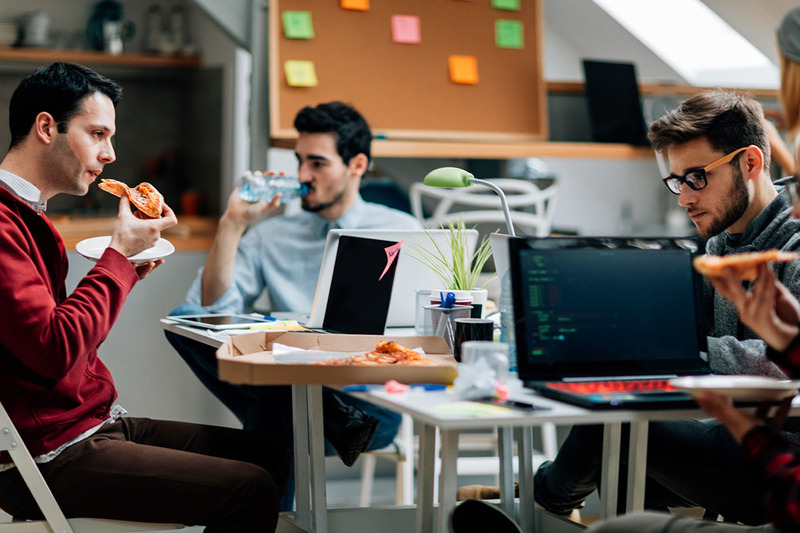 But our sedentary work environments also get a lot of the blame — and even more so, the way we eat in those seated positions. Employees who reported weight gain said stress eating, skipping meals, workplace celebrations and the evil office candy jar were notable culprits. CareerBuilder also found that 73% of workers snack at work, with 77% of women doing it, compared to 69% of men. The 35-44 age group snacks the most (79%). It might be time to rethink your office eating. Tired of the same old selection at the vending machine? Nearby deli cashier knows you by name? Stop the daily deluge of money from your pockets to the cafe’s tip jar. Here’s how to eat better and be healthier on the job. Try making your own snacks to keep at work. Homemade kale chips are considerably cheaper than the store-bought kind, and you can customize the flavor of this healthy snack. Making your own hummus, granola or Lunchable-style snack packs can satisfy your midday cravings while saving you a few bucks a week. Alternatively, the kids at heart among us can prep any of these easy-to-make and cost-effective school-lunch alternatives. If you don’t want to spend time prepping snacks, opt for healthy fruits and veggies. Buying what’s in season near you can help shrink your produce bill. Meal planning can be time-consuming, but the benefits last all week — or longer, if you really plan ahead. Preparing more filling breakfast and lunch options can help you curb the urge to snack nonstop. Try making a batch of healthy muffins you can freeze and grab each morning. No time to cook? We get it. But man cannot subsist on curly fries alone. If you’re heading toward the fast-food counter, check out your healthiest options under $5. By choosing sides wisely and going light on sauces and dressings, you can enjoy a fast fix without too much guilt.